The Literature of Leisure and Chinese Modernity. Honolulu: University of Hawaii Press, 2008. pp. 242. As Laughlin himself has indicated elsewhere, reportage and modern xiaopin wen stand in a certain relationship of opposition, with the former representing the mainstream of literary non-fiction on the left, and the latter favored by writers who preferred to develop artistic prose while keeping political concerns at arm’s length. [ 2 ] Literature of Leisure, however, invites us to think of xiaopin wen within a larger literary context; namely, as a dynamic alternative to a canonical mainstream of “serious” writing–and in particular, realist fiction–that draws readers’ attention to China’s modern national dilemma. Laughlin argues in the Introduction that as an alternative literary discourse, modern xiaopin wen influenced the literary field in several distinct ways. For one, its proponents’ conscious affiliation with the leisure literature of the past, most notably the impressionistic, self-expressive literary writing of the late-Ming dynasty, contravened New Culture mandates that modern literature be new in form and spirit. Also, through humor and irony, xiaopin wen of the 1920s and 1930s often critiqued progress and modernity in ways akin to European modernism, thus setting this genre apart from the progress-centered narrative C. T. Hsia and others have identified with modern Chinese writing. But most important to this book’s structure and argument is the idea that the modern xiaopin wen genre inherited and extended older practices of generating literary community, especially communities of writers and readers interested in critiquing orthodox Confucian morality through their attitudes toward leisure pursuits. Most of the book is organized around literary communities in the form of groups of writers who “particularly cared about the modern Chinese essay and wanted it to make a mark on literary history” (23). 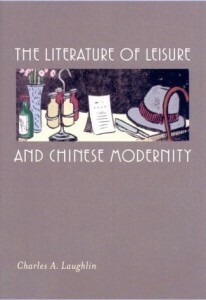 The first chapter sets the stage by describing the reception during the early 1930s of premodern “literature of leisure” (xianqing wenxue), a capacious category including classical-language xiaopin wen, vernacular fiction, diaries, and memoir, originating mainly in the late-imperial era, and endorsing attitudes of intimacy, individuality, and cultural sophistication. Laughlin finds this attention to tradition embodied in the writings of Zhou Zuoren, in collections of late-Ming xiaopin wen edited by the likes of Shi Zhecun, Shen Qiwu, and Zhu Jianmang, as well as in journals devoted to the essay form, such as Threads of Conversation (Yusi), This Human World (Renjian shi), The Analects Fortnightly (Lunyu banyuekan), and Cosmic Wind (Yuzhou feng). The point made here is that this interest in tradition was not, as one might think, a retreat from the modern. Rather, the revival of late-imperial leisure literature represented a positive trend quite modern in itself. In part this was because the revival responded to the demands of readers and the market, but also because the promotion of these za, or “leftover categories” of literary writing, implicitly critiqued the monolithic intellectual aspirations of the New Literature movement and the revolutionary literature that grew out of it. The substance of the book lies in chapters two through five, which selectively and in roughly chronological order guide the reader through the work of four groups of xiaopin wen writers. Now, at 181 pages (minus endnotes and other back matter), Literature of Leisure is not an especially long book. The challenge, then, is how to represent, legibly and meaningfully, what Laughlin quite frankly describes as the “vast and indistinct corpus” of modern xiaopin wen. His solution balances socio-historical considerations (membership in salons and societies, affiliation by publication, division by period, association by geography, etc.) and aesthetic features, all with an eye toward how these multiple factors variously intersected to produce identifiable cohorts of xiaopin wen writers between the years 1924 and 1937. This blend of history and aesthetics is reflected in the titles of chapters two through five, each of which matches a literary group with a word that captures a shared group style. For instance, to locate prototypical examples of modern xiaopin wen from the 1920s, Chapter Two identifies a “Threads of Conversation” group centered on the journal of that name, and then explores how writers in this group helped set the terms for the modern xiaopin wen by variously deploying the trope of “wandering.” Thus we see Zhou Zuoren’s essays digressing in an idiosyncratic web of intertextual references, Yu Pingbo generating a sense of the ineffable in his impressionistic wanderings by boat on Hangzhou’s West Lake, Fei Ming wending through culture and topography in excerpts from his lyrical novel Bridge (Qiao), and the woman writers Lu Jingqing, Chen Xuezhao, and Shi Pingmei inventing styles of “emotional wandering” against the traumatic backdrop of political violence directed at Beijing’s students. Laughlin’s goal is not to force all these writers into a single stylistic rubric, but to show how each author contributed a distinctive, personally expressive voice to their authorial community. Where “wandering” sets the tone for the Threads of Conversation group, “learning” is what unifies the styles of essayists whose relationship was defined professionally and geographically: the “White Horse Lake” group, a collection of writer-educators imprinted by the experience of teaching at the progressive Chunhui Middle School on the shores of White Horse Lake in rural Zhejiang province during the first half of the 1920s. Among these writers–including Xia Mianzun, Feng Zikai, and Zhu Ziqing–Laughlin identifies a tension between didacticism and aesthetics, morality and sensuality. He finds that these essayists, while not immune to the attractions of leisure and pleasure, placed greatest value on the utilitarian aspect of essay writing: its socially constructive function within the realm of education. Chapter Four, the epicenter of the book, examines the xiaopin wen of the Analects group, who lifted the genre to its peak of popularity during the 1930s. The name Analects is borrowed from Lin Yutang’sThe Analects Fortnightly, the leading magazine in Lin’s ambitious publishing enterprise, which encompassed the journals This Human World and Cosmic Wind. Labeled “enjoying,” this chapter might well have been called “smoking,” for that is the hedonistic pleasure Laughlin singles out as most representative of the trans-cultural, anti-utilitarian position expressed in the Analects group’s essays. Here Laughlin comments on how remarkable it is that Lin Yutang and his cohort of multilingual, cosmopolitan sophisticates did not link tobacco smoking to the imperialist scourge of the Chinese nation, opium, even though both were referred to as yan. Instead, this group’s irreverent, often humorous essayistic discourse on smoking becomes a vehicle for, on the one hand, asserting a contrarian attitude of non-conformist enjoyment and, on the other hand, sporting an intellectual and spiritual connection to American and British educational culture, and in particular that of Oxford University where, as these writers would have it, learning takes place in a sophisticated pall of tobacco smoke. This kind of learning, however, has little or nothing to do with that defined by the White Horse Lake group. Whereas those authors grounded their work in the didactic mission of the modern essay, the Analects group self-consciously departed from the practice of writing for moral, social, or political purposes. As one would expect, writers on the left saw the large audience for Analects group xiaopin wen as a threat to their vision for modern literature. Chapter Four thus ends with a brief discussion of this leftist response as it emerged in the pages of the magazine Taibai and the 1935 essay collection Xiaopin Wen and Cartoons (Xiaopin wen he manhua). Laughlin in this instance observes how, despite their aversion to the politically detached road xiaopin wen had embarked on under Lin Yutang, the very popularity of the form drove these leftist writers to counter the Analects group with xiaopin wen of their own, in effect diversifying the short essay form even as they opposed it. The fifth chapter describes in depth another, quite different response to the Analects group: the appeal to high aestheticism led by He Qifang and Li Guangtian, members of the “Beijing school” authors who, while sharing the Analects group’s belief in the political autonomy of writing, had no interest in promoting attitudes of humor and irreverence. After cautiously describing this school’s emergence through Xu Zhimo and the Crescent Moon group, Laughlin works through the trope of “dreaming” to show how He and Li adapted the xiaopin wen form to their own artistic priorities. In principle this meant appealing to the idea of a pure literature that stressed “values of beauty, timelessness, and human truth” (157). In practice, He and Li created lyrical, fragmentary, dream-like essays that departed from existing xiaopin wenfor their appeals to narrativity, but remain linked to that genre through their “mode of play, role reversal, and discursive fragmentation and reconnection” (166). The book’s Conclusion itself aims at a certain reconnection by lightly tracing the legacy of the xiaopin wen from the 1940s to the 1990s. The woman writers Su Qing and Zhang Ailing, both prominent in the 1940s, are described as inheritors of the modern xiaopin wen style, as is the male socialist-era writer Yang Shuo, known for essays steeped in revolutionary lyricism. Lastly, Laughlin mentions a re-emergence of Republican-era xiaopin wen‘s “unassuming yet sophisticated and fluent discourse” in essays by writers of different generations in the 1990s. As Laughlin candidly admits, there is much more to be said about the modern Chinese xiaopin wen. But with its carefully structured balance between sociohistorical and aesthetic concerns, and its thoughtful consideration of the multiple stylistic responses this genre inspired within the field of Republican-era writing, Literature of Leisure will remain a touchstone and a guide for future work. I found intriguing the close relationship between the Analects group’s xiaopin wen and cartoons (manhua), whose popularity peaked simultaneously in the mid-1930s and in some of the very same magazines, suggesting a community of artists whose penchant for humor, irony, and political autonomy overlapped both written and visual genres. Other individual readers will surely be prompted to other insights. The broader significance of Literature of Leisure lies in how the book promises to intervene in the way modern Chinese literature often ends up being taught: as a dead serious examination of China’s modern historical dilemmas. That approach is probably with us to stay. But given Laughlin’s groundbreaking contribution to understanding xiaopin wen, as well as recent and much-needed translations of the genre, like Tam King-fai’s A Garden of One’s Own, the door has opened even wider to understanding the diversity of expression that animates modern Chinese literature as a whole. Laughlin, Charles A. Chinese Reportage: The Aesthetics of Historical Experience. Durham: Duke University Press, 2002. Pollard, David, tr. and ed. The Chinese Essay [Ku chin san wen Ying yi chi]. New York: Columbia University Press, 2000. Tam King-fai, tr. and ed. A Garden of One’s Own: Modern Chinese Essays, 1919-1949. Hong Kong: Chinese University Press, 2011. [ 1 ] A review of Chinese Reportage can be found on this site. [ 2 ] See Laughlin’s review of David Pollard’s The Chinese Essay. This review may also be read as a pointed summary of some of the issues he addresses at length in Literature of Leisure.